Release of the new Yamaha high-speed dispenser “YSD” -Major advances in tact time and dispensing performance- - News Releases | Yamaha Motor Co., Ltd.
Yamaha Motor Co., Ltd. has developed the new high-speed dispenser model “YSD,” boasting the industry’s highest levels of tact time at 0.07 sec./shot plus improved versatility. This new model will be released for sale on July 1, 2013. Plans call for the new YSD to be on display at the JISSO PROTEC 2013 (15th Jisso Process Technology Exhibition) scheduled from June 5 to 7, 2013 at the Tokyo Big Sight exhibition center (Koto Ward, Tokyo). Currently, demand is still high for the dispensers that apply adhesive to temporarily fix surface-mount parts and components onto PCBs. At the same time, there is a strong demand for models that can accommodate the increasing density of part concentration on today’s PCBs. Furthermore, in addition to adhesive application, there are new uses emerging such as application of supplementary solder paste to large lands in the case of mounting complex mixes of extra-small chips and large-size components. Attention is also focusing on the potential of dispenser technology to perform other tasks such as permanent bonding of parts like shield cases, sealing and coating of things like insulation, dam and fill applications, etc. In recent years, demand in the SMT market has become much more sophisticated and diverse in its calls for greater productivity. 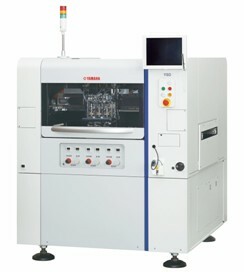 To answer this demand, as Yamaha’s first new dispenser model since the YGD released in April 2004, the YSD is a high-speed, high-performance, multi-functional model that achieves major improvements in tact time and dispensing performance while providing new functions such as non-contact dispensing, line dispensing and more for increased versatility. ・Over 20% faster tact time than the YGD at 0.07 sec./shot. ・	Improved dispensing accuracy (±0.05 mm μ + 3σ). ・Non-contact dispensing and line dispensing available as options. ・Handles large-sized PCBs up to 510 mm long and 460 mm wide. ・Touch panel as standard equipment for improved operability. ・Meets CE marking requirements.Meets CE marking requirements. ・Operable on low compressed air level of 0.45 MPa. ・Easy conversion of Yamaha surface mounter data to dispenser data possible. ・Newly developed head unit with reduced weight. ・Latest servo control system adopted (same type as the YSM40). ・High-rigidity platform (same type as the YS12). ・High-speed response valve ensures consistency in dispensing dot shape.